Electric underfloor heating systems are relatively simple to install. 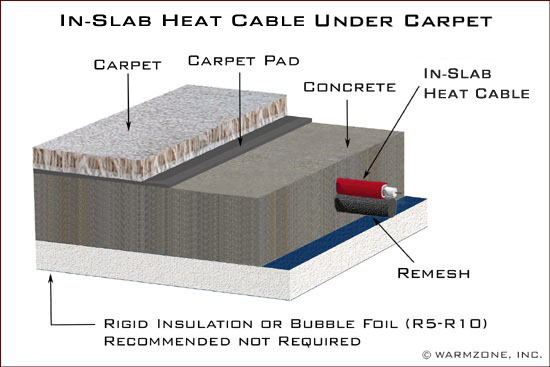 The thin, flexible radiant heat cable allows you to easily customize your floor warming system to meet the unique layout of your home or office. Warmzone carries a variety of premier floor heating systems that are designed to deliver safe, efficient heating that will provide decades of comfortable warmth for you and your family. The ComfortTile floor heating system is not difficult to install. However, for warranty purposes, it is necessary to have a qualified electrician wire the system. Homeowners can do much of the installation themselves. The cable can be laid out and secured to the subloor with ease. Thinset is then applied over the heating cable and tile is then installed on top. 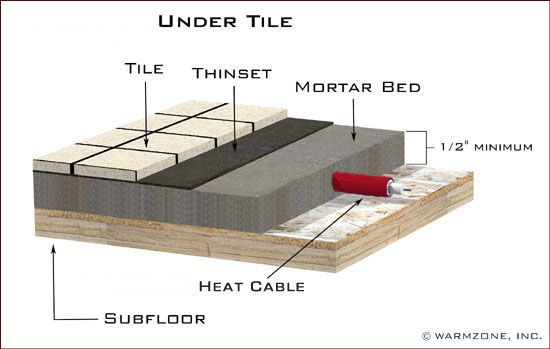 To install a heated floor in your bathroom, follow the procedure outlined below. Measure the room and draw a sketch to help you calculate which floor heating package you will need. Then sketch in the position of the ComfortTile floor heating mat. Mark the positioning of the toilet before you remove it. (Use a marker to draw around the base.) This helps you avoid placing the toilet on top of the floor heating mat, and allows you to position the ComfortTile cable accordingly so you avoid piercing it with the toilet screws. Glue the flex pipe for the sensor into this channel and seal the end of the pipe with a piece of tape. Clip through the flexible netting to allow placement of the heat cable over or around objects as needed. CAUTION: Make sure that you only cut the mesh backing and do not cut or damage the floor heating cable! 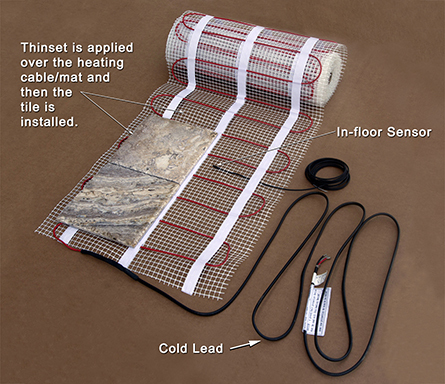 When you reach corners or objects that require custom fitting, turn the ComfortTile floor heating mat (after the netting has been cut) and use the self-adhesive back to position it as required. (Make sure that the subfloor is swept clean so that it is free of dust and particles prior to securing the heating mat.) The self-adhesive backing can withstand 10-20 adjustments, so you can move the mat several times until you are satisfied with the placement. Depending on the new floor surface you are installing, after you have positioned the ComfortTile cable mat, you can encapsulate it using a self-leveling screed or cover it with a thin layer of Quick Level or thin-set (tile adhesive). Now you are ready to install the finish surface of your new radiant heated floor.